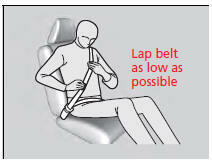 No one should sit in a seat with an inoperative seat belt or one that does not appear to be working correctly. 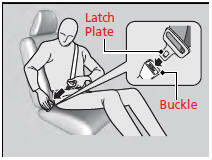 Using a seat belt that is not working properly may not protect the occupant in a crash. Have a dealer check the belt as soon as possible. Never insert any foreign objects into the buckle or retractor mechanism. 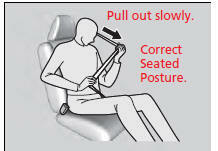 Improperly positioning the seat belts can cause serious injury or death in a crash. Make sure all seat belts are properly positioned before driving. To release the belt, push the red PRESS button then guide the belt by hand until it has retracted completely. When exiting the vehicle, be sure the belt is out of the way and will not get caught by closing the door.